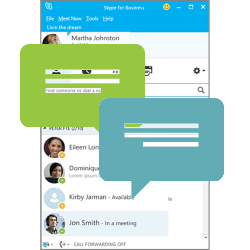 Sometimes, you need to change your Lync or Skype for Business account, either to a new username or perhaps a new domain name. Like me, your account details are possibly all over social media and various networks, and whilst you can change them, people will inevitably try to contact you using your old details. Setting up an old email account to respond automatically or even redirect is trivial - all modern email servers, including Office 365, provide this capability out of the box. 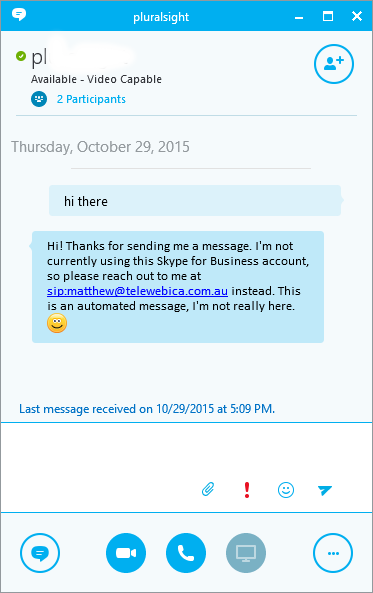 But Lync 2013 and Skype for Business server really have this ability. This simple application logs in with your old credentials, and listens for new IMs. When one is received, it sends back a response, and optionally forwards the original message, including the senders details, to your new address. 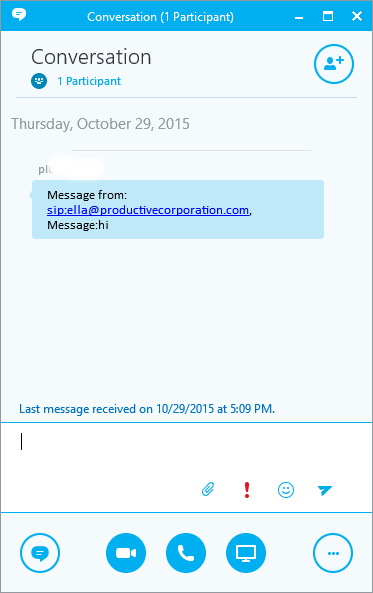 This makes it easy to send them a message from your new account letting them know that you're still contactable. This is because we are effectively creating a session with the old account and listening for new IMs. A message that is automatically sent back to the original participant - typically notifying them that your address has changed. The application will automatically respond in real-time. Message sent to old address, and response automatically received. Original message forwarded to new account, with link to original sender's address. The Auto Responder application is remarkably simple, and consists of a few basic steps. In the code above, I'm injecting a new sendMessage call into the conversation and passing it my response message - this is a simple way of replying to the original participant without having to start a new message process. In the example code below, I've used this code from this article but simplified it into a single function, accepting the destination address and the message itself. You can also choose to automatically forward the incoming message to a different account, by entering it in below. so that you can start a new conversation with them if you wish. If you don't want the message to be forwarded, simply leave this blank. You can then call the sign_in() and start_chat() methods in the application instead of waiting for the button click events, resulting in an application that automatically logs in and starts the chat service.